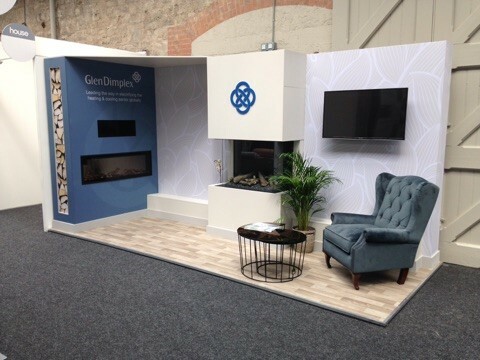 It was another busy year for Glen Dimplex at House, Ireland’s most inspiring interiors event, which took place in the RDS from 25th - 27th May, where the leading fires distributor showcased a variety of technologies and styles for electric fires. Opti-myst, the world’s most realistic electric flame and smoke effect - an illusion so effective that we believe it is difficult to distinguish it from the real thing. Opti-V utilises the latest High Definition TV technology to create flames and sparks for a virtual fireplace experience like no other. Optiflame is the world’s most popular electric flame effect and can be found in a wide selection of Dimplex fires. The show offered consumers a change to view two new additions to the electric fires range; the Faber e-MatriX - a stylish, sustainable and ‘smart’ fireplace from the premium MatriX series and the Dimplex Ignite XL - a lifelike and visually stunning electric fire ideal for home or high rise installations as it has a depth of only 5.5 inches and no requirement for a chimney or gas line. Completing the display was the ever popular PGF20 fully built-in electric wall fire with Opti-V effect. For more information on the fires displayed at House or for further information on any of our electric fires, please contact salesireland@glendimplex.com or call +353 (0)1 842 4833.